The play Key Change tells the story of some of the most marginalized women in the United Kingdom: prison inmates. 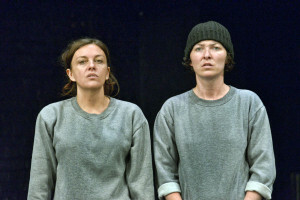 Written by Catrina McHugh and directed by Laura Lindow, it won the 2015 Carol Tambor Best of Edinburgh Award and ran at the Edinburgh Fringe Festival, and it’s easy to understand why. The plot revolves around a group of five women, exploring how and why they ended up in prison, what they left behind on the outside, and what they hope for their futures. 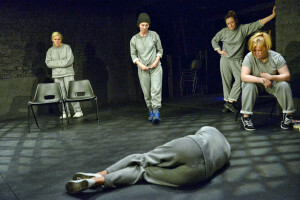 Working with a minimalist set consisting of little more than a few chairs and lines of masking tape attached to the floor, the cast members do a brilliant job of drawing the audience into the little-understood world inside prison walls. Among the characters is first-time prisoner Lucy (played by Cheryl Dixon), the wife of an abusive husband who tries her best to protect her three children but ends up falling victim to temptation and getting caught shoplifting. During her first day in prison, she meets the strong and fiery Angie (Jessica Johnson), who is serving her third prison sentence. Angie was abused as a teenager, kicked out of her parents’ home, and suffered the tragic death of her newborn baby. She winds up living on the street where she first encounters repeat offender Kelly (Christina Berriman Dawson), who introduces her to heroin. Great-grandmother Kim (Judi Earl), whom Angie met at a women’s shelter, is the oldest member of this group. Music plays a key role in the emotional impact of Key Change. After hearing the painful story of Lucy’s abuse, fellow prisoner Lorraine (Victoria Copeland)—who also serves as a stage manager—cues the song “Kiss with a Fist” by the group Florence and the Machine. As the play ends, the women count how many nights they have until they are free again, while the strains of Florence and the Machine’s “Dogs Days Are Over” play in the background—evoking a feeling of hopefulness for the future. Key Change was originally performed for a group of male inmates in England. As Carol Tambor remembers, “The men’s responses were fascinating. Many had no idea of their complicity in their girlfriends’ and wives’ crimes.” It raises the questions of how men can be unaware of how their actions affect the lives of those closest to them, and what can be done to change this reality. Key Change helps to shine a light on the lives of women whose unfortunate choices in life and histories of domestic abuse have led them down a path to drug addiction, criminal actions, and incarceration. The raw portrayal of these five inmates gives voice to their painful stories. Hopefully, Key Change will continue to reach larger audiences—it was brought to New York City in January 2016—and inspire others to address this important issue.